Jim Cullum Jr. (born September 20, 1941) is an American jazz cornetist known for his contributions to Dixieland jazz. His father was Jim Cullum Sr., a clarinetist who led the Happy Jazz Band until 1973. Jim Cullum Jr. has led the Jim Cullum Jazz Band as its successor. His band mates have included Evan Christopher, Allan Vaché, and John Sheridan. With his father, Cullum established the San Antonio jazz club The Landing in 1963. He has broadcast performances from the club on the Public Radio International series Riverwalk Jazz since 1989. Cullum has performed at Carnegie Hall, The Kennedy Center, and Austin City Limits. He has recorded for Jazzology, Columbia, Audiophile, Stomp Off, and his label, Riverwalk. From 1993 until 2005, Cullum and his band were on the faculty of the Stanford Jazz Workshop at Stanford University in California. In 2011, Stanford University Libraries acquired Cullum's "Riverwalk Jazz" archives, comprising over 400 radio show programs. In January 2013, Stanford's Archive of Recorded Sound made the recordings available to listen to on its web site. The Jim Cullum Jazz Band is an acoustic seven-piece traditional jazz ensemble. Since 1989, the band has been featured nationally on their weekly public radio series, Riverwalk Jazz. The band performed live at the Landing Jazz Club on the San Antonio River Walk from 1981 to 2011. The Jim Cullum Jazz Band is the successor to the Happy Jazz Band, which was formed in 1962 by Cullum and his father, Jim. The next year, a group of San Antonio investors founded the Landing Jazz Club in the basement of the Nix Hospital building on the San Antonio River Walk. The Landing was the second business established on the Riverwalk after the Casa Rio Mexican restaurant. Cullum took over leadership of the band after his father died in 1973 and changed the name to the Jim Cullum Jazz Band. The Mission City Hot Rhythm Cats, a six-piece traditional jazz band, is composed of several former members of the Jim Cullum Jazz Band. ^ Carlon, Mick (December 12, 2012). "Jazz Columns: San Antonio's Jim Cullum Jazz Band - By Mick Carlon — Jazz Articles". jazztimes.com. ^ "Riverwalk Jazz | Public Radio International". www.pri.org. ^ "Riverwalk Jazz - Stanford University Libraries". riverwalkjazz.stanford.edu. Related to Jim Cullum Jr. Ten Gallon Shuffle is the first recording released by the New York-based Toshiko Akiyoshi Jazz Orchestra featuring Lew Tabackin. The composition Ten Gallon Shuffle was originally commissioned by Phi Mu Alpha Sinfonia Music Fraternity for the University of Texas Jazz Orchestra. Monopoly Game is the sixth recording released by the Toshiko Akiyoshi Jazz Orchestra featuring Lew Tabackin. The three tracks, "Kyoto Paradox", Caribbean Dream" and "Urban Rhapsody" make up the three part "Suite for Koto and Jazz Orchestra" commissioned jointly by the San Francisco Jazz Festival and UCLA. The song "Jazz Club" was commissioned by NHK Radio. 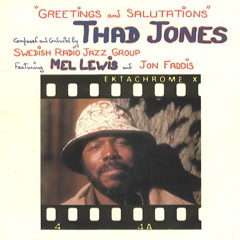 Greetings and Salutations is a 1975 big band jazz album recorded by the Swedish Radio Jazz Group with Thad Jones, Mel Lewis and Jon Faddis as guest bandleader / performers. 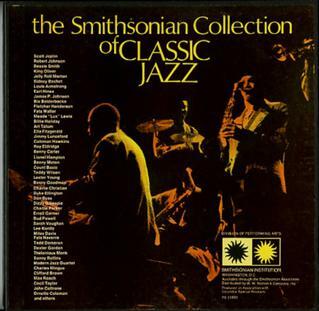 The album was nominated for a 1978 Grammy award in the Best Jazz Instrumental Performance - Big Band category. Featuring Paul Gonsalves is an album by American jazz pianist, composer, and bandleader Duke Ellington. Without new material to work with, Ellington recorded the album with his orchestra and saxophonist Paul Gonsalves in 1962 during a four-hour recording session. It was not released until 1985 by Fantasy Records. Braggin' in Brass: The Immortal 1938 Year is a compilation album of American pianist, composer and bandleader Duke Ellington's 1938 recordings for the Brunswick label which was released in 1991. "Singin' the Blues" is a 1920 jazz composition by J. Russel Robinson, Con Conrad, Sam M. Lewis, and Joe Young. It was recorded by the Original Dixieland Jass Band in 1920 as an instrumental and released as a Victor 78 as part of a medley with "Margie". The song was released with lyrics by vocalist Aileen Stanley in 1920 on Victor. In 1927, Frank Trumbauer, Bix Beiderbecke, and Eddie Lang recorded and released the song as an Okeh 78. The Trumbauer recording is considered a jazz and pop standard, greatly contributing to Frank Trumbauer and Bix Beiderbecke's reputation and influence. It is not related to the 1956 pop song "Singing the Blues" first recorded and released by Marty Robbins in 1956. George Shearing in Dixieland is a 1988 album by jazz pianist George Shearing of music associated with Dixieland.